If you are a University of Maryland student and have been cited or arrested for a crime in College Park, it can be one of the most stressful and frightening experiences. Likewise, if you have a son or daughter that is a student at UM, hearing about a criminal citation or arrest can truly be devastating. As tough as it may be to take on the judicial system in Prince George’s County, the real worry is often the potential effects on you or your child’s future. Do not let a criminal case have a lasting permanent impact. It is never easy to deal with these situations, but with the assistance of a skilled criminal lawyer you or a loved one can move on without the scar of a criminal conviction. The College Park lawyers at The Herbst Firm are available 24 hours a day to discuss your case in District Court, Circuit Court, and even academic disciplinary hearings. We have handled hundreds of cases for college students with charges ranging from serious felonies such as robbery, to misdemeanors such as DUI and drug possession. In particular we have handled hundreds of marijuana cases for distribution and manufacturing. Contact The Firm today to set up an appointment at our main office, or anywhere that is convenient for you. College Park is not a particularly sizeable city, but with a population of about 30 thousand people it is one of the larger and well known cities in the state. The population fluctuates a great deal, and can actually double in when students are in school. 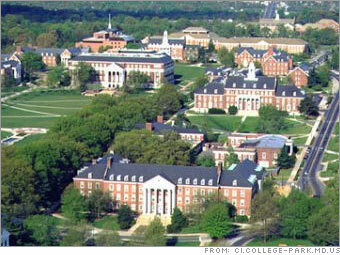 The University of Maryland is by far the largest institution in the state, and one of the most well known in the world. It is also the biggest employer in the area with over 13 thousand people working at UM. The city has had a controversial history when it comes to growth and development. Longtime residents, faculty, and students alike have frequently voiced their displeasure with the city’s and the county’s lack for vision for the future of College Park. Unlike most major college towns in the country there is really no defined and vibrant downtown area to attract new business. There have been grassroots movements such as Rethink College Park that were initiated to create the vision for the Route 1 corridor, but major progress is still years away. The majority of law enforcement duties in the city are handled by the University Police Department, and the College Park Police. County cops are also present in the city, but chances are that if you come in contact with police it will be the local or school cops. The most common crimes in the city are DUI and drug offenses. Violent crime does occur, but at a lower rate. The Herbst Firm is experienced defending all types of criminal cases, including drug possession and distribution, drunk driving, and theft. We also handle all types of traffic citations. For a free case evaluation, contact us via phone or send an inquiry on our website. Your call or email will be returned promptly by an actual lawyer at the firm.